I’m skipping blogging about some days here and there due to holiday bustle but today was a little bit quieter than it has been. 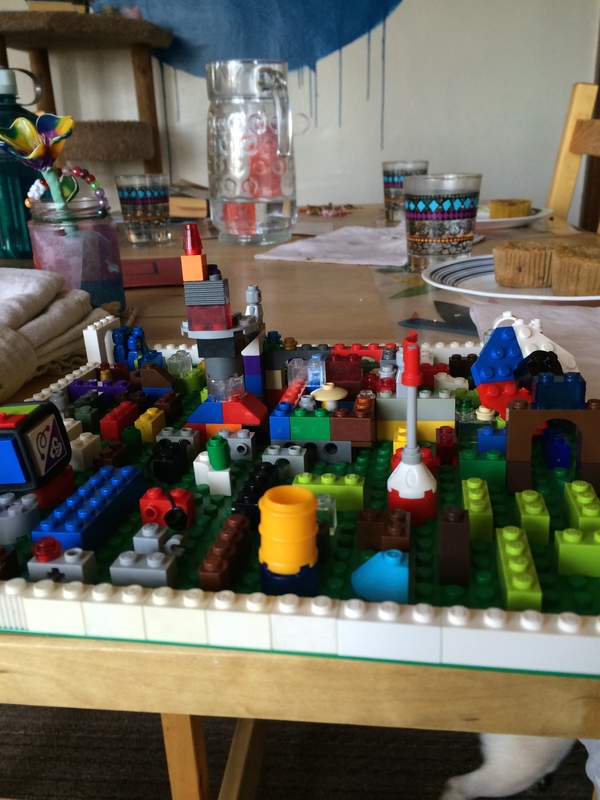 The kids played on the computer and built lego settings for their story telling. After breakfast they helped fold clothes, pick up and vacuum to get the house ready for friends later. Gavin pulled out his lego Hero Factory pieces and built some new “guys”. One of them was named Huge Foot. 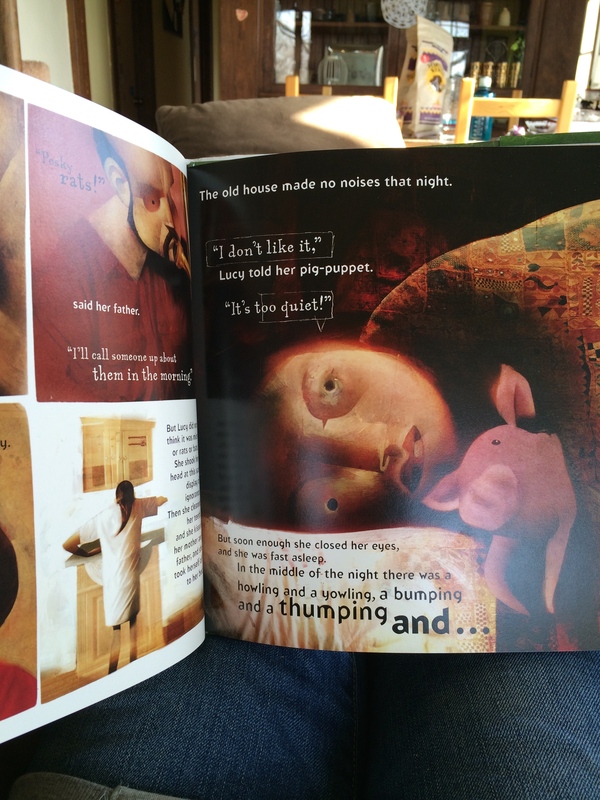 Lilah asked me to read The Wolves in the Walls by Neil Gaiman to her. We took a trip to pick up a gift that we hadn’t already brought home and admired the fountains at the City Creek Center while we did. The kids worked on some math sheets. Gavin has forgotten many of his memorized math facts. I’m not sure how I feel about that. I think we’ll practice a bit here and there if he is willing. The concepts he’s picked up, though, those are still there. He did some reading from Where On Earth (his kids atlas) to me. He still tends to skip words and tumble over himself because his brain reads faster than his mouth. At least that’s my guess. Mid afternoon Lilah and I picked up her friend from school and they started playing with the Hero Factory constructs as soon as we arrived home. As their chosen characters, they visited the center of Egypt. They talked loudly and quietly. They climbed the biggest tree in the world (also known as our holiday tree). After Lilah’s friend left, it was time for dinner, a quick walk around the neighborhood and then reading some more of Julie of the Wolves, which is still starring in their storytelling play in concepts and setting. There was Katamino playing and building. In Katamino you race against your opponent to fill your box completely without leaving spaces. You each get a certain set of blocks. It’s a bit like Tetris but with real blocks. Plus, you can build animals out of the blocks after your game. Lilah made a pony with mane and tail. And then there was Mermaid Island playing, a cooperative game. 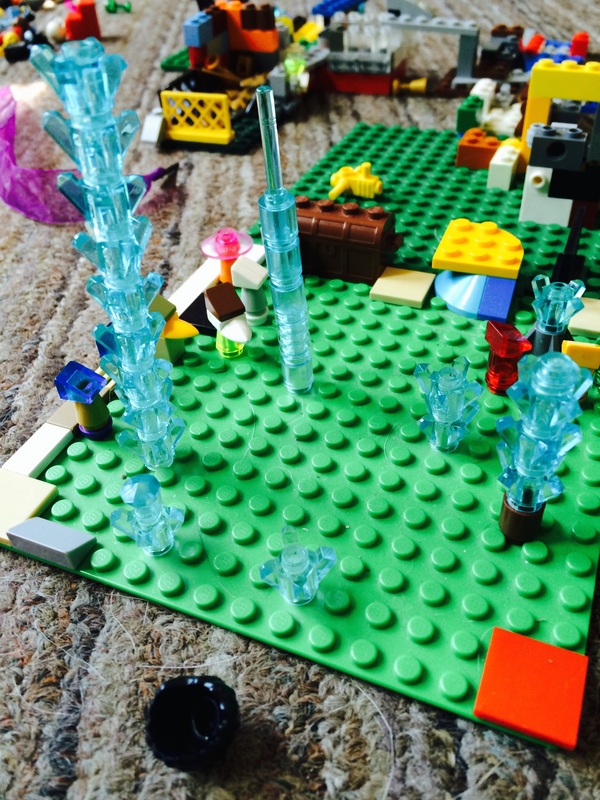 They played in their world populated today by Lego creatures and landscapes. 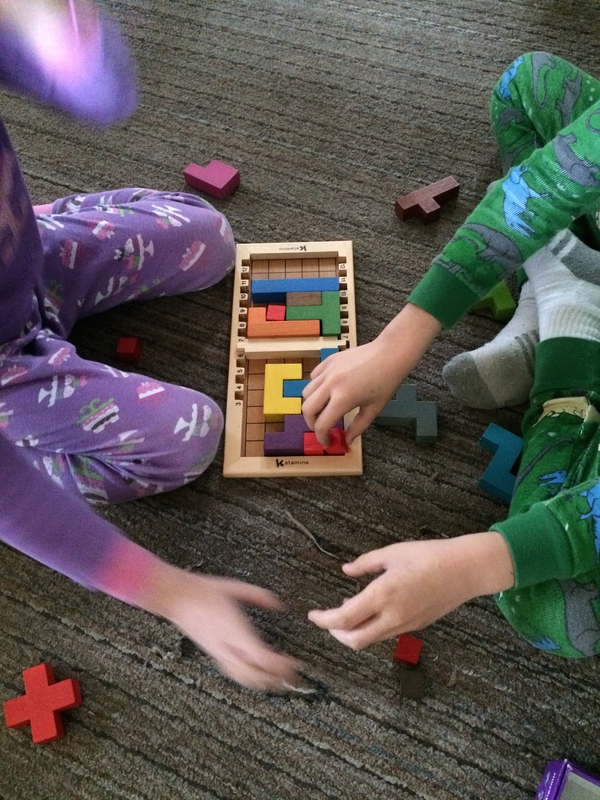 They spend quite a bit of time deciding what kinds of pieces to use for what. Here I think they are looking for parts for a dog they are going to make. Gavin and I played Chess. We finished two games and then Lilah wanted to play with me. In the game with Lilah there was lots of knocking pieces over on purpose along with explaining how different pieces move. Gavin’s gotten a whole lot better than last year at anticipating moves and seeing possibilities, but our games are still very lopsided. I will often point out to him that he’s moving into a dangerous position to help us both enjoy it more and give him a better chance. I have many fond memories of playing Chess when I was younger and often feeling quite frustrated by my own abilities not being what I wanted them to be. Gavin requested again that we get No Stress Chess which is a set of cards that levels the playing field by telling you which piece to move every turn. I definitely think it would be fun to do that with the kids when they are just beginning to get the idea of the game. Then it was time to go roller skating. Today the kids both skated on their own for about a half hour before wanting the balance supports the rink offers. They are doing great but I think they get tired and then prefer the supports because it’s more fun to worry less about falling. Pretty soon they’ll be zooming around me out on the rink. They’re getting close! We like to give high fives as we skate past each other. After skating we came home and had dinner together and then read another chapter of Searching For Dragons before bed. There was computer play to begin the day. 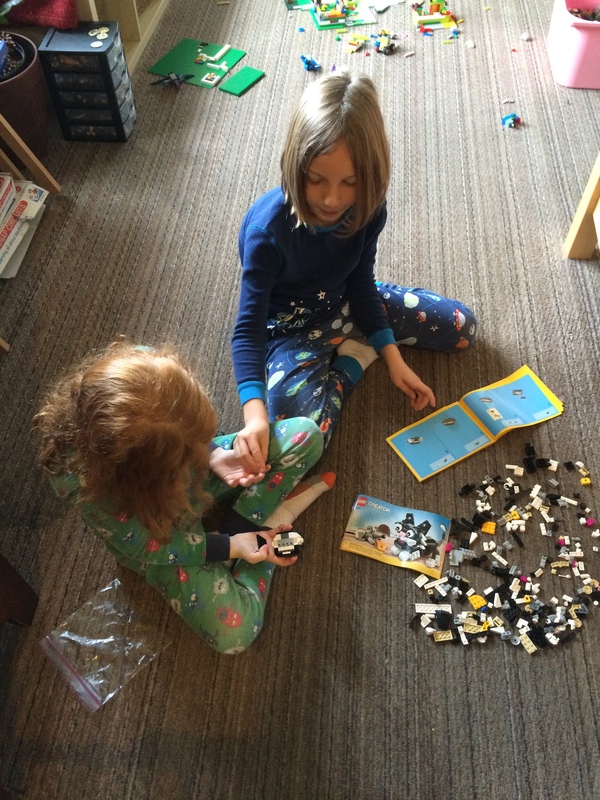 They got out Lilah’s Lego Creator set that builds either a cat, dog or rabbit and put the rabbit together. They carefully read the instructions, found the right pieces and negotiated who did which parts of the building. 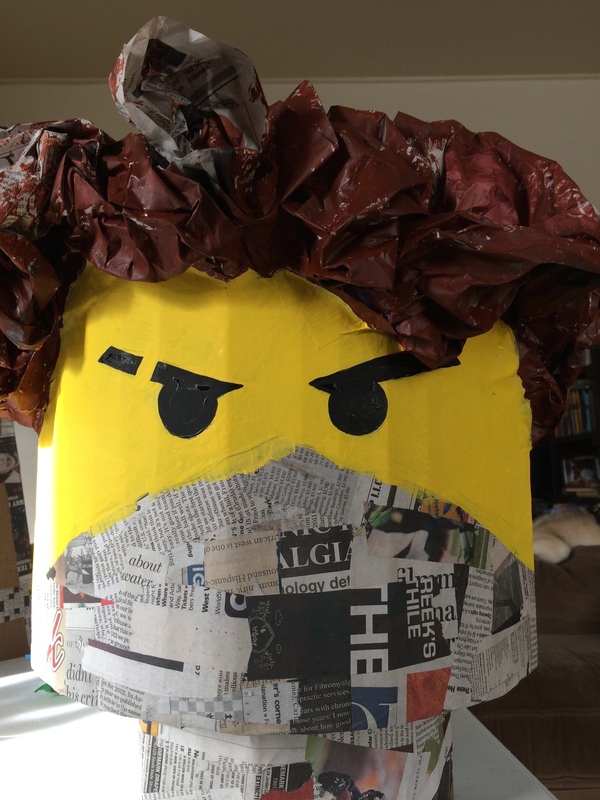 We worked on Gavin’s costume more after breakfast. A few more holes were cut and then more paper mache was added. 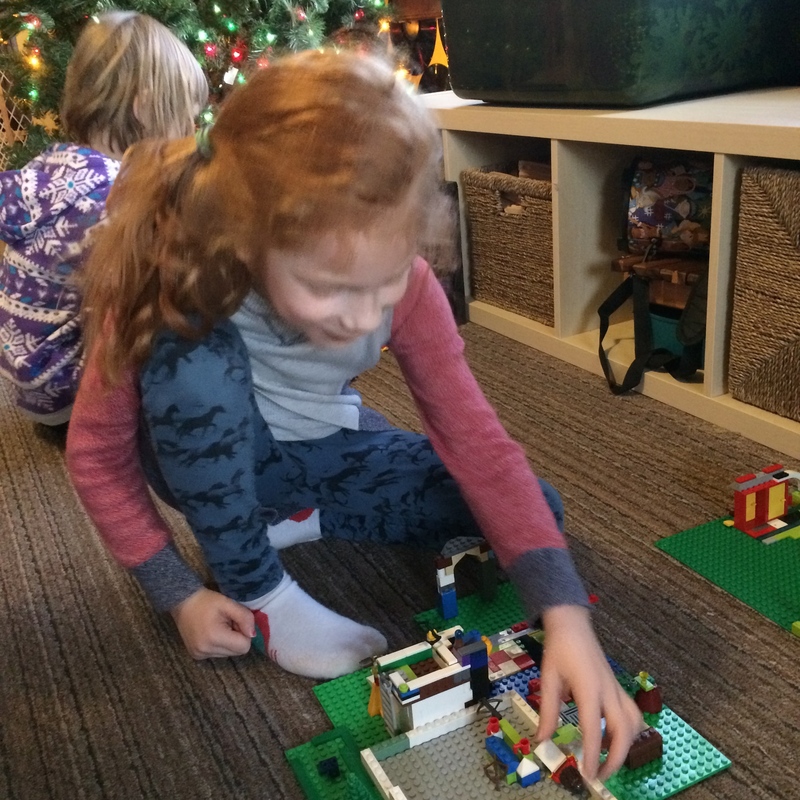 When we finally finished the paper mache process, Lilah disappeared into their room to read for a while and Gavin designed and built a Lego game. 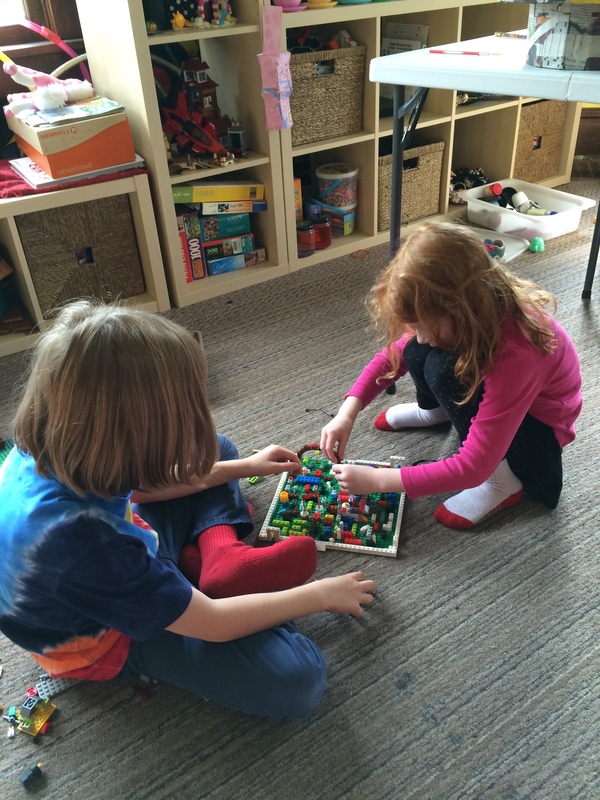 After breakfast, they played his new game together. There was lots of giggling and explaining. Here’s a close-up of the game board, all set up. As a player, you choose a character who navigates around the board, rolling a dice to decide the outcome of various challenges. After lunch we practiced some Spanish and then painted a little bit on the parts of the costume that were dry enough and that needed the colors of paint we had in the house already. Brown for the hair and yellow for the face. 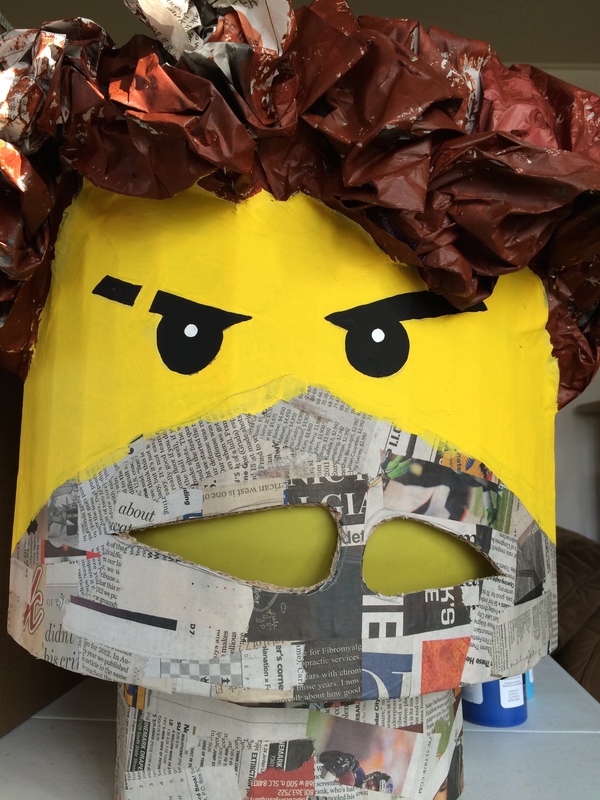 There was more Lego play for the kids while I painted the eyes and eyebrows black on Gavin’s costume. We happened upon a really fun science video: http://themetapicture.com/refraction-magic/ showing refraction. We all want to try this out! Then we headed to the roller skating rink. It was crowded today because the district has off for UEA weekend, but still plenty of room for us. The kids started without the supports, then skated with them and afterward, both of them skated free and happy and even begged to stay later to skate more on their own! They are getting better and better and it’s really fun to watch them enjoy it. They always like to try things too on the rink, like skating backward or turning around in circles. Today it was skating in a crouch. I practiced my slowing and stopping and bringing my skates together and apart without lifting off the ground. When we got home it was time to paint the eye highlights white while Lilah put on her skates and skated around the living room and then it was dinner time. Chris headed to the craft store to get lots of blue paint while I read and sang to and cuddled with the kids before bed. 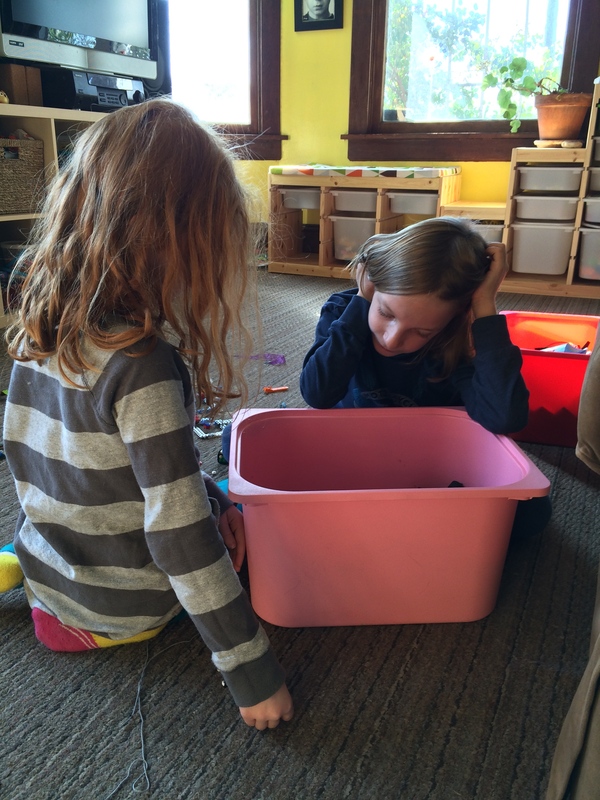 They played on the computer at coolmathgames.com, helping each other when they got stuck. Breakfast and request for me to read more Juniper by Monica Furlong. We only began yesterday and are halfway through because they keep asking for more. It’s a wonderful story and they are fascinated. There was some more letter writing to friends. We cut open the celery stalks that we put in water and red food coloring over the weekend and checked out the red xylem inside. The color went all the way up the stalks and into the leaves! 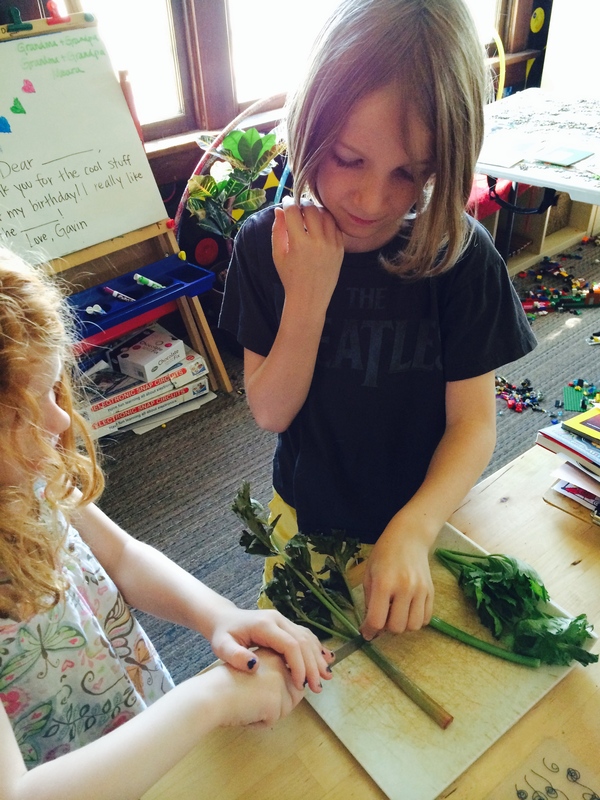 They really enjoyed cutting it and checking out the inside and comparing our dyed and undyed celery. We mailed letters at the post office and learned what a parcel is. We talked about where post offices are in our city. 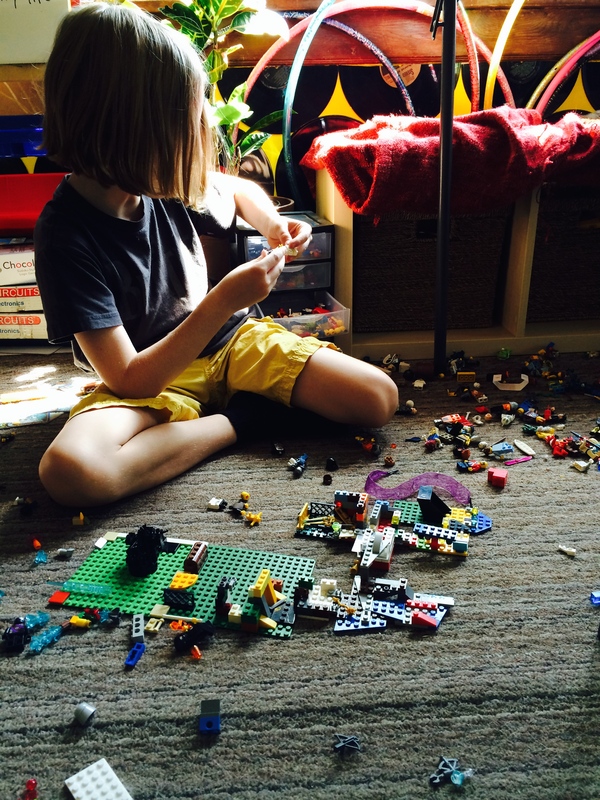 Back at home, we had lunch and lego play. They made geysers today, thinking of our recent trip to Yellowstone and recalling geyser names they’d seen there for their creations. Then they watched The Lego Movie while I did a bit of weeding. Afterward, more lego building and reading Beautiful Lego by Mike Doyle. Then, we are off to the library where choose books to bring home. Then Gavin reads aloud while we drive to pick up our CSA share and back home. And more reading of new library books and a chapter of Juniper. It was a wonderful day together.